In college, I took an international politics class, and ended up studying Iraq with a nationally recognized expert on that country. It was a fascinating time to be studying that region, as the U.S. was gearing up for war and eventually invaded Iraq a few months after I finished the class. I remember writing a short paper on why invading Iraq was a bad idea (to be fair to my powers of prophecy, I stole the idea from a Foreign Affairs article I was summarizing). I still think invading Iraq was a bad idea, even if Saddam Hussein was a bad guy. But this post isn't about America's iniquities in Iraq, or atrocities in Afghanistan, or even our long-ago capers in Cuba. 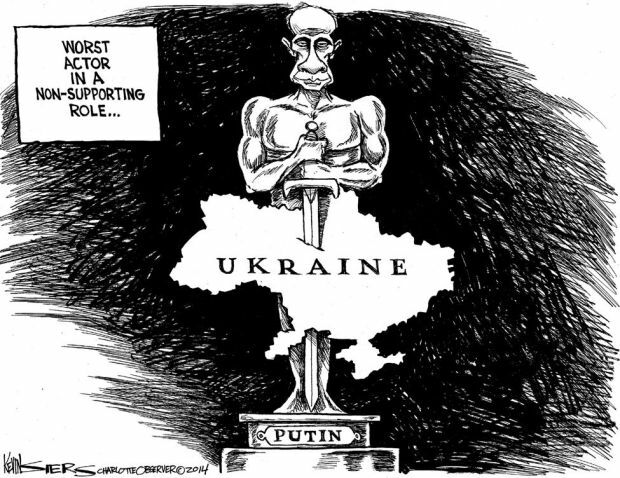 Rather, it's about Russian President Putin's power grab in Crimea. Yet often, America gets accused of hypocrisy when we condemn aggression by other nations. Living in Russia for a year and a half, I got a whole earful of ordinary Russians' world views. I learned who really won World War II (spoiler alert: not the Americans), and why things were better and more stable under Soviet rule. It opened my eyes when one girl told of growing up in the post-Soviet era 90's, awakening one day to find that prices in the stores had doubled overnight while her family's wages stayed the same. It helped me understand why people viewed the (relative) stability that Putin brought as a good thing. True, their lives weren't great, but ordinary was better than chaos. Returning from my mission, I took a Russian culture class (which should be required BEFORE going on missions, but that's another story). In learning more about Russian culture and history, I learned about the leaders who had managed to unite the diverse and huge geography that makes up Russia. It is not easy to rule such a country, and Russians have typically favored strong leaders. They don't have much positive experience with democracy. Yet, even knowing the background of some of Russia's world view, and allowing for my own hypocrisy in supporting American intervention in other conflicts like Afghanistan, I still feel justified in condemning this aggression by Russia. Ukraine, and Ukrainians, threw out a leader in a popular uprising. The country is working towards new elections. You should not invade a sovereign nation just because they overthrew the government that was friendly to you. Critiquing American hypocrisy is deflecting attention from the fact that Russia condemned such actions but is now endorsing them to further its own goals. Let the Ukrainian people (including the ethnic Russians!) decide their own fate.